Acne is not a response of bad diet or poor hygiene, and it most certainly is not a ‘just’ a cosmetic problem. Many people become extremely self conscious, making Acne a condition that can and does affect peoples’ lives. The aim of Acne Treatment is improve the health of the skin, reduce appearance of acne spots and improve Acne Scars. The role of Our Specialist Team in Acne Treatment, is to restore self-esteem and improve the quality of life. Acne is caused by over activity of the sebaceous glands which secrete oily substances, sebum, onto your skin. The sebaceous glands of people with acne are especially sensitive to normal blood levels of the male, hormone, testosterone, found naturally in both men and women. Excessive production of testosterone, may also cause Acne, such as elevated testosterone in polycystic ovary syndrome. If you are prone to acne, testosterone triggers the sebaceous glands to produce excess sebum. At the same time, the dead skin cells lining the openings of the hair follicles aren’t shed properly, which clogs up the follicles. The Bacteria, P.Acne, found naturally in the skin, feed on the dead skin cells which provide a fertile medium for P. Acne to multiply. Growth of P. Acne produces the infection within the pores causing inflammation typical of Acne. If the infection cannot discharge onto the skin surface, the sebaceous gland becomes swollen and a nodule forms. Everyone could experience some form of Acne. As well as teenagers, more and more men and women are experiencing adult onset Acne. 75% of teenagers and up to 40% of adults will suffer from acne spots, blemishes. Why should I have Treatment for Acne? Acne should be treated by a Medical professional who is experienced in Skin Health and Acne Treatment. Without intervention Acne can lead to scarring and pigmentation, PIH, resulting in loss of self-confidence and poor self-esteem, which can be difficult to treat. Why does scarring and pigmentation occur with Acne? Acne lesions, spots and blemishes cause inflammation within the dermis. The more severe the Acne lesions, the worst the inflammation, with increasing damage to the dermal collagen. Healing of the Acne spots, lesions occur with scar tissue in the dermis. Commonly this is seen as depressed Acne scars, box scars or ice pick scars. Certain skin types are more prone to post inflammatory hyperpigmentation PIH, and the more severe the inflammation in the skin, the more intense the PIH. Dark skin (Skin of Colour), Asian or Oriental skin is more prone to PIH. Therefore, early treatment of Acne is important to reduce the risk of Scarring and Hyperpigmentation, PIH. How is active Acne treated? Reduce levels of the P. Acne bacteria. Using combination therapy, Acne spots, blemishes can be treated and the results maintained. We recommend the use of effective skincare products eg. using Retin-A to balance oil and sebum production, Salicylic Acid and a Benzoyl Peroxide face wash for mild Acne to unclog pores, and balance natural skin exfoliation.Therapeutic treatments can include: physician strength skin peels, Omnilux Blue Light, or laser acne therapy – non invasive treatment that uses light therapy to dramatically reduce P. Acne bacteria in the sebaceous glands and skin.Acne is not caused by poor diet, but maintaining a healthy diet rich in antioxidants Vits A C E and minerals such as zinc will support the skin in its healing process. Smoking can worsen the effects of acne, so we recommend that you stop smoking if you are troubled by acne spots, blemishes. When Acne has been resolved there may still be some damage to the dermal layers of the skin causing superficial or deep scarring. There may also be some abnormal pigmentation, PIH left in the skin from the lesions. Treating the pigmentation and stimulating collagen synthesis with Laser therapy or now with the Dermaroller which is an FDA treatment for acne scaring…with proven results. A course of treatments is recommended in combination with anti-oxidant serum. What reassurance do I have with Acne, Acne Scar Treatment? 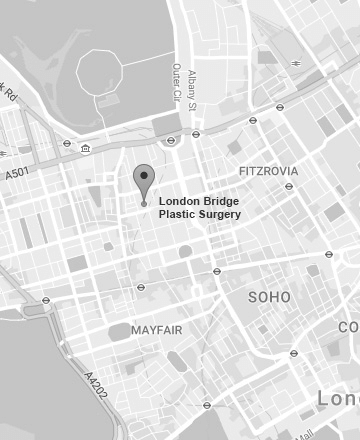 At London Bridge Plastic Surgery & Aesthetic Clinic, we understand that your decision to have Acne, Acne Scar Treatment, can be a daunting and anxious time for you. Our aim is to fully understand your concerns and desires, and assess your Skin and Acne, Acne Scarring accurately, before agreeing on a treatment plan which is in your best interest. If for any reason you are unsuitable for Acne, Acne Scar Treatment, you will be advised against Acne Treatment. We will provide you with all the information you need and support before, during your Acne, Acne Scar Treatment. What is the cost of Acne, Acne Scar Treatment? The cost for Acne, Acne Scar Treatment will vary depending on the treatment(s) required. An accurate quotation can only be provided following your consultation.